The Bible has long taken flack from skeptics. One of the most popular targets for jokes about the Bible is the story of Noah, the Ark, and the global Flood. Christians often call it Noah’s Flood. I think it would be more appropriate to call it God’s Flood. It wasn’t actually Noah’s idea, but he was fortunate enough to be along for the ride and be saved through the disaster. Genesis says God judged the world by this Flood. But because Noah was a righteous man, he and his family were spared on the Ark while the world perished. Often people have trouble with the idea of God judging the world, or with God judging sin in any way. But I would say that if God just allowed evil to continue indefinitely he would not be holy or worthy of our worship. He has to judge sin to be good. But to wipe out all human life on Earth seems harsh to us. But it is not actually God judging sin that is made fun of as much as the idea of an Ark and a global Flood of water. There is an effort from skeptics to make people think that the judgment is implausible because the idea of a global Flood and saving the animals is implausible. But is it implausible for there to have been a global Flood on the Earth in the past? The plausibility of the Ark is another question. I’d say that question is best answered by visiting the Ark Encounter in Kentucky, built by the Answers in Genesis ministry. Young age creationists have been defending the idea of a global Flood for a long time. It’s worth pointing out that Jesus himself taught that the Flood was real. He said that his own return will be similar to God’s judgment of the Flood of the past (see Matthew 24:37-39). People will be going on with their lives, until it’s too late. Also the Apostle Peter wrote about the Flood as well (2 Peter 2:5 and 3:3-7). So even if we somehow fail in relating it to science, how can a Christian say that both Jesus and Apostle Peter were wrong to believe in the Flood? Also, it won’t work to claim the Bible doesn’t really teach that the Flood was global. That is too easily refuted by reading Genesis and that would also contradict Jesus and Peter. I would like to briefly list some of the best geological evidences for the global Flood judgement described in Genesis. The Flood is something that likely involved God supernaturally intervening into history. But even if it was caused supernaturally there should be physical evidence of the effects of such a massive catastrophe. Well qualified creationist geologists have done field work and good research for over 50 years to look for evidence for a global Flood. I believe creationist research on this has had a lot of success. There used to be a number of difficult questions evolutionist geologists could bring up to challenge creationists. But today I would say most of those questions have been answered. There are always particular sites that there are differences of opinion about and there are ongoing mysteries. Establishing good arguments often requires years of work. But people in science should not think that the Flood has been disproven. Creationists have been quietly and sometimes not so quietly collecting evidence. The evidence is there if you look for it. Sometimes it requires learning to look at the facts a different way. Evolutionist scientists rarely know hardly anything about any of the research creationists have done. One more clarification on Flood evidence. Some things that are used by Christians as Flood evidence are actually just local examples of processes that are rapid and catastrophic. The Mt. St. Helens volcanic eruption in 1980, for example. The Mt. St. Helens eruption doesn’t conclusively prove Noah’s Flood. But it doesn’t need to. What it did was it gave us examples of catastrophic processes that could do things in a rapid fashion that geologists had thought would require long periods of time. So it demonstrated the kind of processes that could happen on a bigger scale in the real global Flood. The processes relevant to Mt. St. Helens I’m thinking of would be rapid erosion of solid granite in one place, hundreds of layers of sediment deposited in hours, and various effects from large mudflows, just to mention a few. Sometimes Christians who try to argue for the Flood don’t quite know enough to present it properly. I think some of the best evidences for the Flood are things that require large scale catastrophic events. God’s global judgement in the Flood is one giant catastrophe that would have spawned many local and regional catastrophes. Evolutionary geologists tend to believe in many smaller catastrophes, or sometimes storms, spread out over long periods of time. But creationist geologists interpret the same facts differently, as catastrophes that happened in a shorter time. If they were events that happened in a shorter time, this often makes them related to the Flood. But creationist and evolutionist geologists actually use the same methods of investigation and good field work, but interpret the facts differently. Megasequences are groups of layers of sedimentary rock that cover large areas. They can cover thousands or tens of thousands of square miles and they can be hundreds to sometimes thousands of feet thick. The sequences of rock give clues about what happened to the Earth in the past. Creationists have documented how many of these large layers and sequences of layers are better explained by a global Flood than by the evolutionary ideas. Evolutionist geologists tend to look at these layers as forming over long periods of time, such as by rivers that sort of migrate or by temporary inland seas. But these kind of local effects are often inadequate to explain the details. A global Flood would not happen in a simple manner like steady rising water. It would involve water flowing from multiple directions and sea levels that would go up and then down the up more, and so on. One extraordinary example would be the Coconino Sandstone that is in the Grand Canyon. This rock layer has a total volume of about 10,000 cubic miles! In other terms, this means a rock layer that averages over 300 feet thick and covers an area of about 200,000 square miles. Evidence shows that the sands in this layer were transported large distances. There are a number of sandstone rock layers similar to this. Some include sand that must have been transported over 1000 miles. It is sometimes possible to identify the sources of the sand, and this just makes evidence for a global Flood stronger. Below are a few webpages that explain some of this evidence. What happens if you try to bend a hard rock? Obviously, it breaks. So then how is it that there are many examples of sites where rock layers are actually bent. How did they bend without breaking? Also, related often are layers that tilted large angles. Sedimentary layers must form horizontal, unless something were to cause them to move before they could harden. This can be a very good evidence for a large scale geological event that would fit a global Flood. The larger the scale of the bend or tilts, the better it indicates something like the Flood. A now famous example is called the East Kaibab Monocline in the Grand Canyon. This is near the Eastern end of the Grand Canyon. In that area there are dramatic folds and bends of thick layers. There is one famous site that shows a bend of about a 90 degree angle in thick layers of rock! The layers must have been rapidly deposited, then bent by tectonic movement of the Earth all in a relatively short time before the sediment had totally hardened (or lithified as the geologists say). Sometimes critics bring up the fact that these rocks have cracks in them. But minor small scale cracks misses the point. It’s to be expected that some cracks would form after the layers were bent. You can’t confuse minor small scale effects with large scale effects in this. Bent and tilted rock strata is fairly common if you look for it. It brings up questions about what kind of event would be big enough to do this. It’s often not just that in one place there is one site with bent rock. It’s that if that rock is so bent, what happened to all the other rock around it? If you look at the evidence surrounding these places you see that it would require an event much bigger than anything in recorded history. Here are some webpages that discuss this. Fossil graveyards are sites where many fossils are in one place. There are a variety of examples. Sometimes there are thousands or millions of the same creature in one place, and in other cases there are many types of animals that were buried and fossilized together. Sometimes marine creatures are buried with land animals, which doesn’t happen in normal circumstances. A well known example from years ago was the Cumberland Bone Cave in Maryland. A wide variety of land animals, that would live in different climates today, were all buried together. Today this cave has ben excavated such that there may not be much left there. In Flourisant, Colorado there are many insect fossils as well as plant and other fossils that are of amazing detail. The more detail is preserved in the fossil the more it shows that there must have been rapid burial. If a creature is not buried quickly under the right conditions, it will simply decay away and not fossilize. Recent reports have mentioned fossils in North and South Dakota. Sometimes marine fossils have been buried very near land animals. In dealing with fossil evidence it is often not just the fossils that point to a large-scale catastrophe like the Flood, but the rock the fossils are found in. Often questions are raised about what could cause fossil graveyards. Often it requires conditions drastically different than today. This issue is an example of a topic where Christians and atheists often seriously misunderstand each other. So a Christian will say, “See, there are marine fossils on Mt. Everest and this is because Mt. Everest was covered with water in Noah’s Flood.” Then the atheist would reply saying, “Yeah but the fossils formed when they were on the ocean floor and then the mountain pushed up over a period of millions of years.” In this kind of discussion, both are right in a way and both are wrong in a way. The Christian often misunderstands when they say that the Flood covered Mt. Everest. I say this for the simple reason that Mt. Everest didn’t exist in the time before the Flood. Then the atheist isn’t usually aware of how creationists with a science background really explain mountain building, or these type of fossils. There is evidence that thick layers of sediment once existed on the continents that no longer exist because they were eroded away. This is about layers that sometimes covered large regions and represent massive scale erosion. A good example is in the Western United States. The topmost rock layer at much of the Grand Canyon in Arizona is the Kiabab Plateau. If you follow rock layers from the top of Grand Canyon away from it, especially Northward, there are sites where the Kaibab has other layers on top of it. In fact there are other canyons North of Grand Canyon that are higher in elevation than Grand Canyon, such as Zion Canyon and Bryce Canyon. There are buttes and cliffs showing that there was once much more sedimentary layers than what is seen at the top of the Grand Canyon today. So these layers have often been called the Grand Staircase. The question is what happened to the layers of the Grand Staircase? It’s a very large amount of sediment that was eroded off and the formation of the Grand Canyon seems related to this erosion. Evolutionists have debated various ideas on the formation of the Grand Canyon for years. Creationist geologists have also spent a great deal of time researching Grand Canyon and have found a number of fascinating things that suggest a great Flood. Though creationists have proposed multiple scenarios to explain the formation of the Grand Canyon, I think the scenario that is best is to say it formed from waters running off the continent late in the Flood. As waters started to run off the continent, for a period of time there would have been very large scale rapid erosion, some of which may have started underwater. There could also have been sheet erosion where water flows as a wide flat sheet very rapidly. The sheet erosion could explain the flat surface at the top of the Canyon. Then the water channelized and could erode side canyons as it went. The time scale of a year long Flood event makes explaining the Grand Canyon easier because you could have very thick layers of sediment deposited, then they are eroded before they have time to harden to solid rock. This is not an option in an evolutionist long time scale approach. The Grand Canyon also is a canyon that is cut through an uplifted hill. This has been difficult for evolutionary geologists to explain. There are a number of special types of rock formations that can happen in water or underwater. Scientists have learned more about these formations. Some rocks once considered to have formed from wind-blown sand in desserts are now seen as having formed underwater from wave action. There are also rocks that are now regarded by geologists as having formed by underwater turbidity currents, where sediment flows down a slope under water. These are examples of cases where the prevailing view of certain things in geology has changed and it sometimes tends to provide examples of what a global Flood could do. One of the best examples of this is something I have not seen much documentation or published papers on from creationists, yet it seems like a very good indication of the Flood to me. It is called Hummocky Cross-stratification. This is where sedimentary rock forms in hump-like structures underwater. They form because of the action of strong underwater currents, often changing or crisscrossing currents. The way they were explained to me by a Ph.D. geologist is that they usually represent evidence of a hurricane. It requires a powerful storm to form these structures underwater. They must form underwater in a powerful storm. The interesting thing is where they are found. I was shown pictures of these hummocks at the bottom of the Grand Canyon. Think about this, a hurricane in Arizona? There are examples of this in Colorado also, but those are tiny compared to the pictures I saw of the Grand Canyon. Another place where they occur is on a mountain mentioned in Genesis. Genesis says the Ark came to rest on the mountains of Ararat. Ararat is a mountain range and the largest mountain there is called Greater Ara. This mountain is over 16,000 feet in altitude today, which makes it taller than Pikes Peak in Colorado. I saw pictures taken by a geologist showing large hummock structures at a fairly high altitude on the Ara mountain, perhaps halfway or more up the mountain. I don’t remember the exact altitude. This is very significant. So this suggests that the mountain was covered with water and that the mountain probably began forming during the Flood. Creationist geologists have suggested this from other evidence also for this mountain as well. So this seems to fit the book of Genesis. Earthrise picture from Apollo 8, 1968. Today many do not remember those events, so it is worth taking time to remember. In 1968, I was 10 years old and like everyone else, I was watching the Apollo mission on TV. The Apollo program was an answer to John F. Kennedy’s challenge to America during the time of what has been called the “space race.” The “race” was with Russia because Russia had made it to space before America. So the challenge from President Kennedy was to deliver men to the Moon and return them safely to the Earth before the decade of the 1960’s ended. At the time he issued this challenge, the United States was behind Russia in the space race. So, NASA was endeavoring to catch up with and surpass the Russians. In September 1968, the Russian spacecraft called Zond 5 traveled to the Moon, orbited it, and returned safely to the Earth. But Zond 5 did not carry cosmonauts, instead it carried other life forms to find out what the effect of the radiation of space would be to them. Zond 5 carried bacteria, meal worms, flies, plants, seeds, and two tortoises. Zond 5 followed a couple of failed attempts to orbit the Moon and return to the Earth. But Zond 5 did successfully return and it splashed down in the Indian ocean. The tortoises survived. The tortoises may have had a rough ride on the way back because the spacecraft lost its attitude control, which probably made it spin out of control some. In December of 1968 the lunar lander module was not yet ready and NASA wanted to catch up with the Russians. So NASA advanced the schedule and made the mission for the astronauts to orbit the Moon with just the “command module” and return to the Earth. The Russians sent several spacecraft to the Moon in the late 1960’s and early 70’s but they never sent men. The Russians never sent cosmonauts to the Moon. It really was a very dangerous thing to do. The Apollo 8 spacecraft had to travel about 234,000 miles from Earth orbit to get to the Moon. Then they had to change their trajectory to get into orbit around the Moon. Traveling to the Moon they were moving at about 2,300 miles per hour and they had to slow down but not too much. It took them 68 hours to travel to the Moon. If they went to slow they could crash into the Moon. If they were not close enough to the Moon or they were moving too fast they could miss the Moon or maybe get into the wrong kind of orbit and then not be able to make it back to Earth. They orbited the Moon 10 times over a period of 20 hours. Two memorable parts of the Apollo 8 mission were the picture taken of Earth while orbiting the Moon and the astronauts reading from the book of Genesis. The picture was a beautiful picture showing the blue Earth in the black background of space. 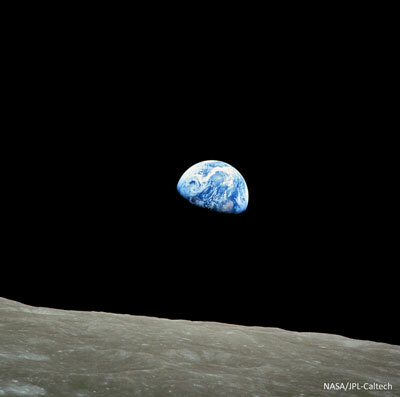 This came to be called “Earthrise.” It was a very inspiring picture and made people talk about how good our planet was. It motivated people to want to take care of Earth. Reading Genesis was a surprise to many people. NASA only told the astronauts “say something appropriate.” But the astronauts couldn’t decide what to say, so they started asking others to come up with an idea of what to say. To hear the story, listen to the podcast below. But I think it was a wonderful reminder of God and a beautiful thing to read from Genesis. It took many people to make the Apollo 8 mission a success. Someone estimated it took 400,000 people. Over the years it has become evident that many people connected to the space program are Christians. During the Apollo years there was a group of people who voluntarily set out to pray for NASA’s missions. They called themselves the Apollo Prayer League. It was not “sponsored by NASA” but a behind the scenes effort from people of faith. There are a lot of quiet behind the scenes efforts of people of faith. They don’t do it for recognition or fame. Other astronauts expressed their faith in other ways. Buzz Aldrin on Apollo 11 took communion on the Moon. Edgar Mitchell went to special effort to take the Bible to the Moon, in microfilm form. There is a book about this effort called The Apostles of Apollo. Another astronaut who is a Christian is Shannon Lucid, a woman. She was on five space flights during the years of the Space Shuttle. One of these included spending some time on the Russian Mir space station. She has a Ph.D. in biochemistry and for a time she held the record for a non-Russian spending the most hours in space. She was part of a special conference in China where some Christian scholars and others went to China to present information to the Chinese government on Christianity. It was called “The Future Impact of Christianity on China.” I knew about this event because another person who is a friend of mine, Dr. Paul Ackerman, was also involved with the trip. Dr. Ackerman is a retired Psychology professor. Shannon Lucid was one of the people on this trip who spoke at this conference. She has a connection to China because she was actually born there as a child of Christian missionaries. Paul Ackerman was not allowed to present the paper he wrote for this conference but he was able to hand out some copies of it. I made a webpage for it on my website, called Christian Principles in Human Affairs. It is very worth reading. The Apollo program was an example of a major project in which many people, some people of faith and some not, worked together to achieve something great. Christians and nonchristians can work together and respect each other. We can learn from these examples as we continue to explore God’s creation.